Considering a robotic vacuum to help you out with the boring household chore of cleaning? This can now become a reality for anyone thanks to the variety of budget options available. Monoprice is known for offering solid products at below-average prices, so we’re excited to put the Strata Home Robotic Vacuum from Monoprice to the test. Read on to see if this is the vacuum for you–and at the end of this review, we’re giving one away to one lucky reader! Dust box capacity: 20.3 fluid oz. Water tank capacity: 10.1 fluid oz. After unpacking everything, you’ll need to charge the vacuum manually before its first run. The manual recommends doing this for at least six hours. You’ll need to plug the included charger right into the unit instead of using the dock for the first time. Auto: The vacuum will clean automatically in a zig-zag pattern. If it encounters a particularly dirty area or hits a wall, it will enter one of the two other modes. Spot: In this mode, the vacuum spins in circles to clean an extra-dirty spot. Edge: When the vacuum hits a wall, it will turn and attempt to navigate around it. Hit the Home button anytime to send the vacuum back to the charging dock automatically. There’s not much to mention about this unit’s appearance; it looks like a typical robot vacuum. However, the shiny black surface of our black test model was a magnet for fingerprints, so you’ll need to wipe it often if you frequently pick it up or use the touch controls. Compared to some other budget units, the Strata Home stands out by offering both wet and dry cleaning. Simply fill up the water tank with some water, remove the dust box with the simple latch, and replace it with the mopping surface. This allows you to clean hardwood floors more efficiently and is a nice touch. Another extra you get is a roll of magnetic tape. Placing this over a doorway or other opening allows you to block the vacuum from crossing it. You can cut this to cover multiple areas, which is useful if you need to block off many areas. Unsurprisingly at this price point, you won’t find any extras like a camera or microphone. The vacuum does use voice feedback when it starts cleaning or returns home, but you can mute it using a button on the remote. If you don’t want to use any network features of this vacuum, it fully works offline. The unit has three buttons for automatic cleaning, spot cleaning, and returning home that are handy in a pinch. Otherwise, you can use the remote to start any of the three cleaning modes, sent it to the charger, enable a schedule, or even steer the unit manually. 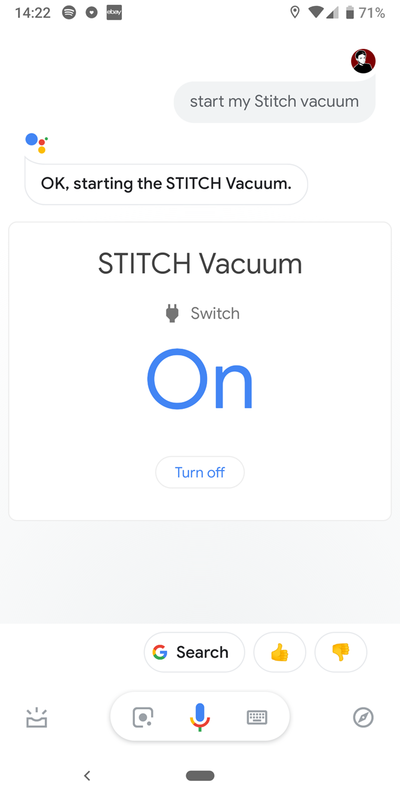 To get the most out of the device, it’s best to set up the Stitch app for Android or iOS on your phone, though. 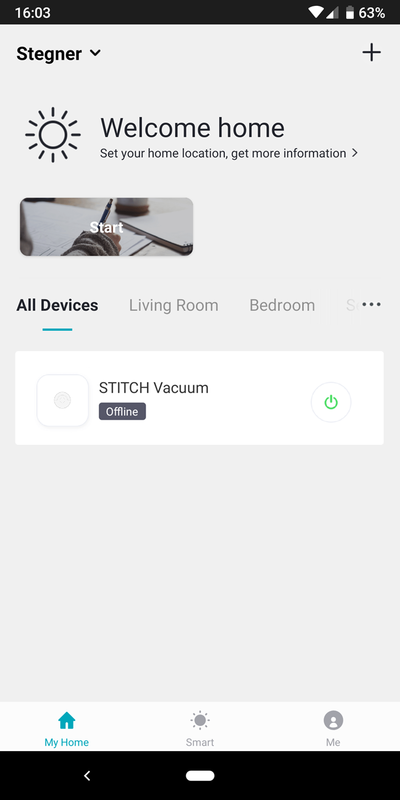 This allows you to control your vacuum from anywhere. 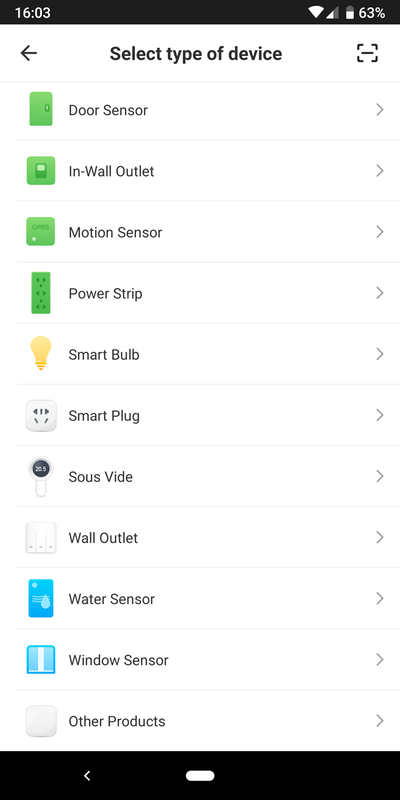 You’ll need to create an account in the app, then set up a “Home” where you can link other Monoprice smart devices. This process is easy enough. When you add a new product there’s no Smart Vacuum option, so you have to choose Other Products. After a few moments, the app should find your vacuum and pair it. You can then assign it to a room and access a virtual remote that’s quite similar to the physical one. 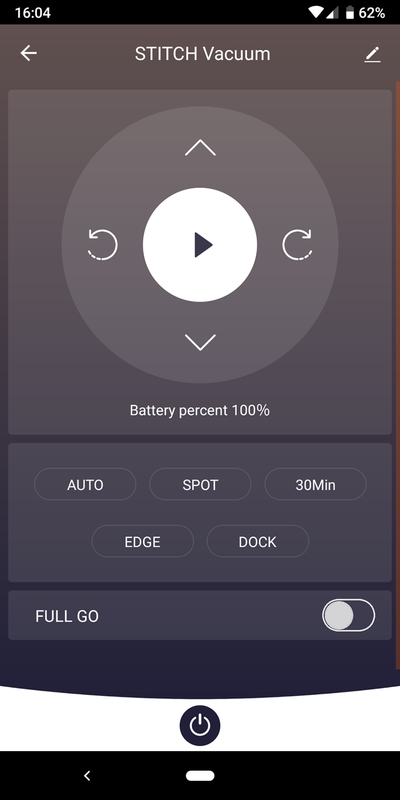 Seeing the unit’s current battery here is convenient. Overall, the app is fairly solid. It worked properly on Android and iOS, and even features extra automation features if you want to dig into those. A minor quirk is that when you turn the vacuum’s power switch back from off to on, you’ll need to force-close the app so it sees the vacuum as online again. Using the remote’s Plan button, you simply set a time on the unit’s display and it will clean at that time every day. Conversely, the app provides more flexibility, as it allows you to set various schedules for different days of the week. Cleaning the same day at every time is probably fine for most people, but the flexibility of the app is great to have. For even more smart home automation, you can tie your Strata vacuum to Google Assistant or Alexa, no hub required. 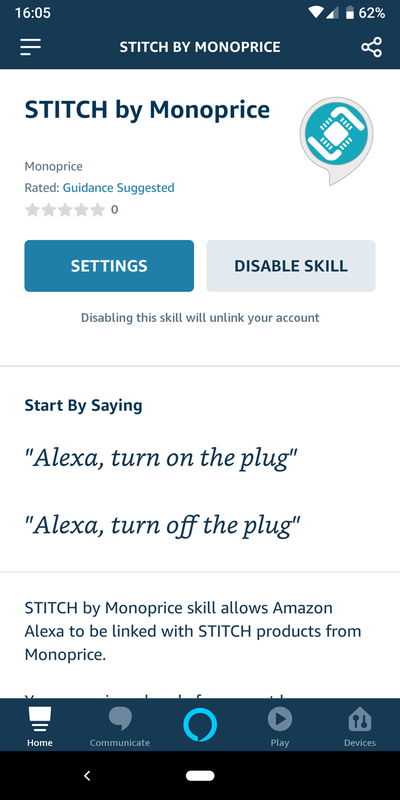 You just need to search for the Stitch skill in the Amazon Alexa or Google Home app, link your Stitch account, and you’re all set. 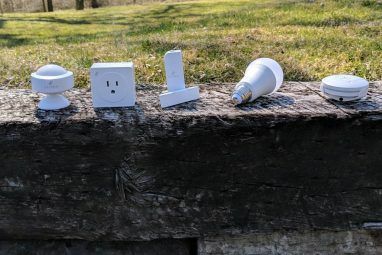 The manual provides instructions for doing this with Alexa, but we had to wander around a bit to find the right way to do it with Google Home. 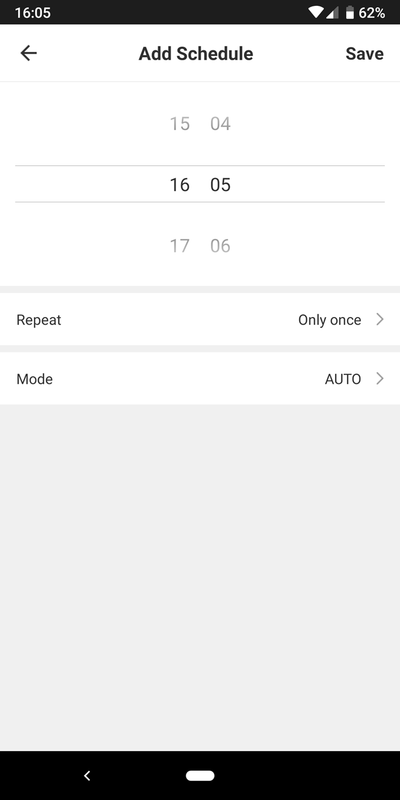 The voice assistant control works, but it’s basic. You can say Tell my vacuum to start cleaning as well as stopping it or pausing it. However, we didn’t find a way to have it return to the dock or change modes via voice control. You’ll probably end up using the remote or phone app as your primary methods of control, with voice and touch as backups. All these extra features are great, but how does the vacuum clean and navigate? Overall, it’s pretty solid. The vacuum picked up plenty of dirt on every carpeted area we tested, as well as a hardwood floor. After spreading some coffee grounds around and having it run through both Auto and Spot modes on them, it cleaned up the majority of them. It left enough that you’d probably want to go over it with a manual vacuum before having company over, but it got the job done. This is the story with most budget robot vacuums, of course. They can’t really replace a good heavy-duty cleaning, but can definitely handle day-to-day dirt. Performance is solid, but this probably isn’t the vacuum to get if you’ve got a house set up like an obstacle course. When placed into an area with a lot of objects sitting around, the vacuum eventually navigated around them but had some trouble. Like other vacuums, be sure to remove cords, strings, and other similar objects because they can get stuck in the brushes. The vacuum’s wheels let it climb small gaps; it occasionally got hung up when moving onto a rug but continued on after a moment. Thanks to the anti-drop sensor, the vacuum won’t fall down steps or similar drops. Is the Strata Home Vacuum Worth It? 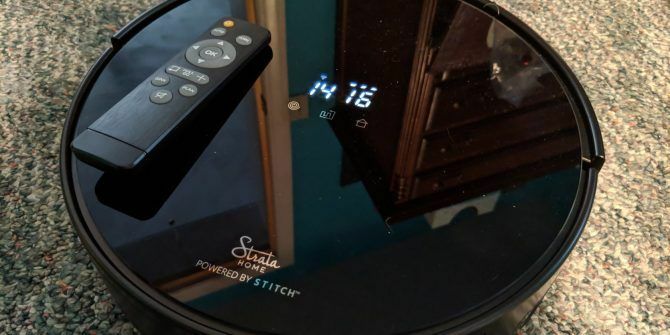 Overall, the Strata Home is a solid robotic vacuum. It cleans well enough, features wet and dry cleaning modes, offers several methods of control, and the app is good enough. The biggest question about whether this vacuum is worth the cost, then, is how it compares to the competition. Our review of the iLife A7 iLife A7: The Best All-Round Robot Vacuum iLife A7: The Best All-Round Robot Vacuum Full featured, well built, superb cleaning power, and great value for money. What's not to love about the iLife A7? Read More found that device an awesome all-around vacuum for the price of about $180. The Strata Home costs $240. For that extra cash, you get the wet cleaning capability and voice assistant control. Meanwhile, Monoprice also offers a confusingly named Strata Home 2.0 vacuum for $130. However, this doesn’t include Stitch support, so there’s no smartphone app, Wi-Fi integration or voice control. In summary, the Monoprice Strata Home robotic vacuum is a good product, but it might not be the right one for you. The robot vacuum market is now sufficiently crowded that every budget and feature set is covered. If you have a more complex environment and would like finer control over which areas are cleaned, opt for a more expensive model with persistent floor mapping, like the Roborock S5/S50 Roborock S50: The Smartest Vacuum Yet Roborock S50: The Smartest Vacuum Yet Incredible navigation abilities allow for zoned cleaning, on top of being the most powerful vacuum you can buy at this budget. Read More . Those who don’t need wet cleaning or voice control should opt for the Strata Home 2.0 model to save some money. But if you’re right in the middle of these two conditions, this vacuum is worth a look. Explore more about: Household Chores, MakeUseOf Giveaway, Robotics, Smart Appliance, Smart Home.